Ostend, Belgium (2015.03.12) - World registry, nearing completion, confirms 228,450 known marine species; consolidation relegates 190,400 other “species” as duplicate identities. Champion of taxonomic redundancy: “Rough Periwinkle” sea snail had 113 scientific names. Over 1,000 new-to-science marine fish species have been described since 2008 — an average of more than 10 per month — according to scientists completing a consolidated inventory of all known ocean life. Among fish species newly-described worldwide are 122 new sharks and rays, 131 new members of the goby family, and a new barracuda found in the Mediterranean. All are contained in the World Register of Marine Species (WoRMS), a landmark international effort to unite all existing knowledge of sea life. In the past eight years, the effort has identified as redundant aliases almost half the names assigned over two and a half centuries to ocean dwelling creatures. Merging scores of global databases, the more than 200 editors of WoRMS found almost 419,000 species names in literature worldwide, of which 190,400 (45%) were deemed duplicate identities. One species of sea snail alone had 113 different names (see elaboration below). WoRMS editors have contracted to 228,450 the number of species currently known to science. About 195,000 (86%) of them are sea animals, including just over 18,000 species of fish described since the mid-1700s, more than 1,800 sea stars, 816 squids, 93 whales and dolphins and 8,900 clams and other bivalves. The rest are species of kelp, seaweeds and other plants, bacteria, viruses, fungi and single cell organisms. Based at the Flanders Marine Institute (VLIZ) in Belgium, WoRMS is a collaborative scientific triumph, constituting a single, authoritative reference list of all marine species described since the pioneering work of Carl Linnaeus. In 2014 alone, some 1,451 new-to-science marine creatures were added to WoRMS — an average of four per day. “Though a few relatively minor gaps remain, we consider the register now virtually complete with respect to species described throughout scientific history,” says WoRMS co-chair Jan Mees, Chair of the European Marine Board and Director of VLIZ. “And, of course, we are constantly updating with newly-described species, revisions of taxonomy, and adding occasional species that have been overlooked.” Dr. Mees adds that an estimated 10,000 or more new-to-science species are in laboratory jars around the world today waiting to be described. Amazingly, says WoRMS fish specialist Nicolas Bailly of the Hellenic Center for Marine Research, new species of relatively large animals are still regularly discovered and described. 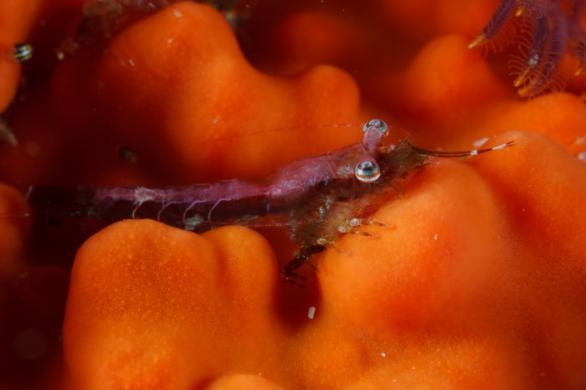 Added just last month, for example: A new species of sea dragon, the ruby red Phyllopteryx dewysea from southern Australia, distinguished via DNA analysis from two other sea dragon species. The Gobiidae family of goby fish boasts the most new species added since 2008 with 131, followed by the Liparidae family of snailfish with 52. Other forms of ocean life described in 2014 include two dolphins and 139 new-to-science sponges. Some previously-discovered sponges have yielded valuable cancer-fighting agents. Studies foresee more than 200 oncology drugs derived from marine life compounds passing clinical trials — pharmaceuticals with an estimated value of at least US$560 billion. Scientists last year also described 12 new marine life families and 141 new genera (family and genus ranking higher than species on the eight-rung ladder of life’s scientific classification). A new genus of animal (Dendrogramma, with two associated species (Dendrogramma enigmatica and Dengrogramma discoides) does not readily fit into an existing phylum — the top classification in the animal kingdom. Further research will resolve the issue but could lead to the historic addition of a new life classification. * Areospora rohanae - A new genus and species of parasite, first noticed by Chilean fisheries workers, that invades and causes lesions on the valuable King Crab. The taxonomist dubbed the little critter after his daughter. After consolidating all marine life databases, WoRMS experts have crowned a new champion of taxonomic redundancy: Littorina saxatilis (popularly known in English as the Rough Periwinkle; photos, credit Antonio França: http://bit.ly/1DCJsUu), a sea snail with a shell that ironically resembles the Horn of Plenty. It has been described and named 113 times in all. The taxonomist who finds and describes a new species earns the right to name it. And in 1792 young scientist Giuseppe Olivi first described and named Littorina saxatilis in a catalog of animals in the waters around Venice. Subsequently, other taxonomists worldwide found and described this ubiquitous creature in many colorful variations, assigning the species a cornucopia of Latin identities (all listed here, with links to maps of its location and other information). In all instances of a species found to have a superfluous description and name, WoRMS accords precedence to the oldest work (though to aid research all synonyms are noted). Formal scientific taxonomic description involves a slow, exacting process recently accelerated by DNA identification techniques and other new technologies. And there’s a daunting challenge ahead: Researchers with the Census of Marine Life of 2000-2010 (within which WoRMS was a major component) estimate that between 500,000 and 2 million marine species remain to be discovered and described. Even at today’s rate of roughly four per day, describing every marine inhabitant thought to exist would take at least 360 more years. The bulk of new fish species descriptions are based on recent discoveries, studies of museum collection specimens, and reassessments of species with wide range distribution, says Dr. Bailly. For example, many new marine fish descriptions come from a reassessment of species ranging both in Red Sea and Indian Ocean, with a recent tendency to separate the Red Sea populations as new species. Coral reefs still provide 30% of new marine fish species described (mostly Gobiidae and other small size families); another 30% are from the deep sea. Very few are described from the pelagic zone in the middle of oceans between surface and 200 meters depth. WoRMS also includes a rapidly-expanding collection of 50,000 images — a nine-fold increase from 2008 — along with hyperlinks to original taxonomic literature and other information. WoRMS forms an important backbone in LifeWatch, the E-Science European Infrastructure for Biodiversity and Ecosystem Research, which aims to standardize and consolidate species data from different component databases.Thanks to the financial support of LifeWatch, WoRMS has since 2012 filled many previously identified gaps and can continue to grow at its current pace.